In the ocean, mahi mahi display an array of colors, including greens, yellows, and brilliant blues. Within a few moments of being caught, their colors fade considerably. 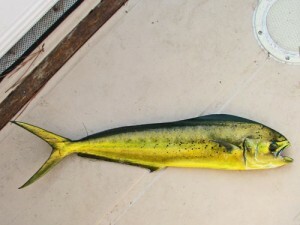 Small mahi-mahi range from 2-5 pounds, while trophy fish can weigh as much as 50 pounds or more. The meat of mahi mahi is firm and white with a delicate flavor. Small mahi mahi fillets are often cooked whole. Larger fish can be filleted and cut into steaks. Mahi mahi is suitable for grilling, frying, baking, or other cooking methods.